I live very near the New Madrid Seismic Zone (NMSZ). If you look on the map below at the bottom of Illinois, you’re in the right area… There’s quite a few dots there representing earthquake activity between 1990 and 2008… Here in southern Illinois, we joke about the fact that pictures on our walls rarely stay straight — we don’t feel tremors, but there’s something shifty about the place. And, of course I do research in the area a little west and south, in Missouri’s Bootheel, right about where all the little circles come together in one massive blob. Recent earthquakes in the New Madrid Seismic Zone (CEUS-SSC catalog, 1990-2008). It’s not the first time in my life I’ve lived in an area with a “live and active” seismic zone — I spent 10 years in Salt Lake City. Salt Lake is one of those metropolitan areas built on a sedimentary basin discussed briefly in Tuesday’s post. We were always expecting “the big one”. That said, I slept through every single earthquake that happened in the 10 years I lived there. Here in southern Illinois, in 2008, we had an earthquake that had a 5.2 magnitude, though it wasn’t the result of activity in the NMSZ. It was, instead, the product of seismic activity in the Wabash Valley Seismic Zone to the east of us and a little north. It hit in the early morning (4:37 a.m.), and like many of my friends, I actually awoke before we really felt it. Then, for a day or so afterward, we had aftershocks… I remember sitting in my office with a student when everything started to shake — it felt more like a big truck rolling past us — and the student I was meeting with (who had slept through the early morning quake) was genuinely puzzled by it. I told her it was an aftershock, and she said, “An aftershock of what?” My point is, we don’t really think about earthquakes happening here and are a little confused when they do, but clearly we should give them more thought. One of the things I learned this week, as I looked through information on the USGS and Missouri’s Department of Natural Resources website is that, because of the nature of the rocks in the earth’s crust in the central United States, “earthquakes in this region shake and damage an area approximately 20 times larger than earthquakes in California and most other active seismic areas.” In other words, while we have fewer big earthquakes, when we do have them they can be 20 times larger (in terms of square miles) than those that occur in California. I also learned that we have small tremors that we do not really notice. Ah… Those picture frames really are moving. The New Madrid fault zone interests me partly because it lies right along the Mississippi River. On the map above, the river is the boundary of Illinois and Missouri. Historically, some of the biggest earthquakes in recorded history on the North American continent have happened in this area. Three major earthquakes happened between December 16, 1811, and February 7, 1812. The weakest of these, in January of 1812 had a magnitude of 7.5. There were aftershocks felt well into 1813. But it was during these earthquakes that the Mississippi River, due to some temporary water falls created by the seismic activity, ran backwards. The effect lasted for a short period of time (a few hours), but it was dramatic and remains the topic of local legend. The study published in Science, authored by Morgan Page and Susan Hough of the USGS in Pasadena, contests the findings of some earlier studies that had suggested the energy in the NMSZ was not building up to a large earthquake because seismic activity in the area was part of a “long-lived aftershock sequence”. It was theorized in this previous work that this seismic activity was releasing energy, and so there would be no build-up to a big quake. Page and Hough think these findings may be misconstruing the nature of the seismic activity. They argue that, instead, it appears to be indicative of on-going processes generating stress in the seismic zone that will, eventually, be released in a large earthquake. In other words, these are foreshocks rather than aftershocks. According to the Missouri DNR website, we’re about 30 years overdue for a 6.3 magnitude earthquake or higher. While the figure is debatable, it is based upon the frequency of earthquakes in recorded history. The last one was recorded in Charleston, Missouri on October 31, 1895, (with a magnitude of 6.7). 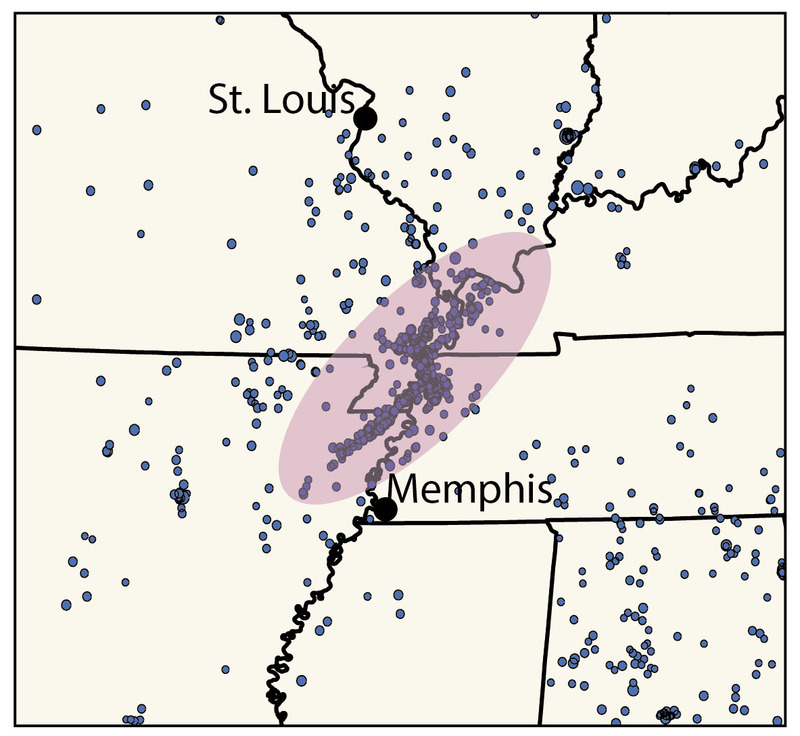 Should a magnitude 7.6 earthquake happen in the NMSZ, damage would occur not only in the Missouri Bootheel, but northeast Arkansas, Western Kentucky and Tennessee, counties in southern Illinois, a large area that is mostly rural and much of which is impoverished; and as far north as St. Louis, stretching south as far as Greenville, Mississippi. This would include the large population areas along the river. Since most damage in an earthquake happens to manmade structures, damage to property would be extensive and would reach into the billions of dollars. I was struck by the fact that most of the descriptions of the area that would sustain damage made no mention of the Mississippi’s presence, nor that the area contains the geological head of the Mississippi delta (at Cape Girardeau, MO), or that those blobs on the map all come together near the confluence of the Mississippi and Ohio River, an area sometimes referred to in government reports as “the confluence region”. But such an earthquake would surely affect the Mississippi, which has an extensive system of levees along both sides and river training structures in it, and many communities living just behind those levees.